That was what a 24 year old Corey “CL Smooth” Penn told the Source back in 1992, when he was asked what he thinks audiences would be into from Mecca and the Soul Brother, the debut album from Pete Rock and CL Smooth. CL and Peter “Pete Rock” Phillips were two hungry hip-hop fiends from Mt. Vernon, New York who’d been clawing their way up through the industry ranks for years. And now was their moment to step into the spotlight. The young CL actually took the moment to play up his producer partner's musicality--but then made sure to remind everyone of that music's themes. And that was the way the world would come to know Pete Rock and CL Smooth, one of hip-hop’s most famed—if famously short-lived—classic-era duos. 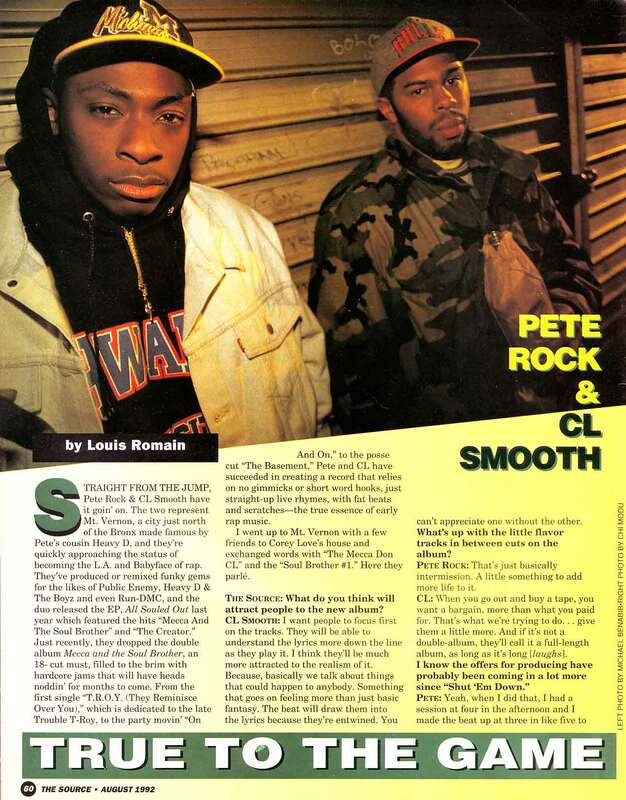 Before Pete Rock would go on to become one of the game’s most revered producers and CL drifted out of the spotlight, the duo’s connection seemed organic; CL with the slick rhymes and Pete Rock with the dope beats. Rock was the younger cousin of hip-hop star Heavy D, and at 17, he'd studied at the feet of superproducer Marley Marl at WBLS. Peter was born in the Bronx but moved to Mt. Vernon as a youngster. Teenaged Pete and CL had become friends at Mt. Vernon High (they attended along with future R&B star Al B. Sure! ), and Rock’s production work, plus their association with established hitmakers like Marley Marl and Heavy D helped land them a deal with Elektra Records, which released their debut EP All Souled Out in 1991. Rock’s reputation began to grow by leaps and bounds over the course of a year. The soon-to-be superproducer was still in the early stages of what would become a legendary career when he began crafting Pete Rock & CL Smooth’s debut album; a release that would only affirm his ascension to the genre's top ranks. He’d co-produced tracks on Heavy D & the Boyz’s Big Tyme back in 1989 and was mentored by Eddie F of the Boyz in the years leading up to All Souled Out. But after a star-making remix of Public Enemy’s “Shut ‘Em Down” and a request to work with Run-D.M.C. on their upcoming album (1993s platinum-selling Down With the King), Rock was already on the fast track to greatness. As the world would soon come to understand, Pete Rock’s future lay in his ability to repurpose the past. More than just grabbing popular James Brown loops or jazz breaks, Rock had an ear that connected great Black music of yesteryear to hip-hop’s tradition in a way that amplified the organic connections between it all. It was the soul of their sound. Rock’s early brilliance and CL’s writing skills would come into full bloom on their debut studio album, Mecca and the Soul Brother. Classic soul and jazz samples define the album, both as the sonic fuel for the songs and as the fleeting intermissions that tie the whole thing together thematically. It’s a brilliantly realized album that announced Pete Rock and CL Smooth as standard-bearers for 90s hip-hop. The album opener, “Return of the Mecca,” is as stripped and straightforward as 90s East Coast boom-bap gets; with CL spitting verses over a percussive loop of the oft-sampled drums from Mountain’s “Long Red” with a hook lifted from Cannonball Adderley and a ghostly flicker of saxophone from “Today” by Tom Scott and the California Dreamers that would be used to much more impactful effect later on the album. “Straighten It Out” remains one of the greatest songs in Pete Rock and CL Smooth’s repertoire. The funky drums (from Simtec & Wylie’s “Bootleggin’”) carry distinctively chiming horns (courtesy of “Kool and the Gang’s 1969 track “Chocolate Buttermilk”) on the hook and a brief portion of “Our Generation” by Ernie Hines. The duo’s sociopolitical perspective informs the spirit of the album, and “Anger In the Nation” features CL turning his focus towards South Africa and the U.S. military, while also dropping his take on history and how it pertains to Africans. “To elevate the Black man is vital,” he declares, with a heavy backdrop courtesy of James Brown’s “Funky President” and an intro from Adofo Abdullah Muhammad. For all of Mecca and the Soul Brother's consistent brilliance, there's no guessing as to what track serves as the album's centerpiece. There are very few hip-hop records as ubiquitous and revered as “They Reminisce Over You.” The song’s history is well known: crafted as a tribute to Troy “Trouble T-Roy” Dixon of Heavy D & the Boyz, who’d died in a freak fall while on the road back in 1990. Pete and CL wanted to show love to their friend from Mt. Vernon, and the duo delivered a heartfelt ode to motherhood, nostalgia and their fallen comrade. Utilizing the aforementioned “Today” sample, (but featured much more prominently than on “Return of the Mecca”), CL paid tribute to family and community. It was an emotional track that would become a hip-hop classic. “It’s hard making anything when someone you know and love passes away, but that’s where the inspiration is drawn from deep in your soul and the love or respect you have for that someone helps you say the right things,” CL explained to DubCNN in 2013. The moody “Can’t Front On Me” is one of Pete Rock’s best productions, (a mishmash of samples from Dave Wintour, Alyn Ainsworth, Tyrone Washington and the Five Stairsteps), CL Smooth delivers some of the best rhymes on Mecca and the Soul Brother. A slowed down bassline from Talking Heads’ classic “Once In A Lifetime,” with a hook courtesy of the Skull Snaps’ “Trespassin’” and standbys James Brown and Bob James sets things off on “If It Ain’t Rough,” It Aint’ Right,” a fitting title for a track that once again goes directly to the heart of no frills booming beats. Released on June 9, 1992, Mecca and the Soul Brother wouldn’t be the commercial smash that Pete Rock would enjoy with some of his more high-profile collaborations. But the album met with widespread critical acclaim and singles were in steady rotation on hip-hop radio as well as national video shows like Yo! MTV Raps and Rap City, raising the duo's profile. 25 years later, the album stands as 90s rap pillar; one of the East Coast’s last truly great albums before the commercial success and G'd up aesthetic of Death Row Records shifted hip-hop’s focus to the West Coast. Over a span of nine months, A Tribe Called Quest (The Low End Theory), Gang Starr (Daily Operation) and now Pete Rock & CL Smooth had carved out a new identity for non-commercial East Coast hip-hop; one that would come to define the genre’s ethos in the coming years via a wide range of acts from Camp Lo to Mos Def. And Mecca and the Soul Brother would come to represent a semi-pinnacle for Pete Rock & CL Smooth. The duo would drop the critically acclaimed follow-up The Main Ingredient in 1994, but the album wouldn’t fare as well as its predecessor commercially. And while Pete Rock had become one of hip-hop’s most in-demand producers, his relationship with his partner was fraying. The Main Ingredient arrived after the Notorious B.I.G. and Wu-Tang Clan changed the image and presentation of East Coast hip-hop; and the shift in focus only added to the strain. In a 2008 interview with Todd Davis of Riotsound, Rock reflected on how things deteriorated between him and CL. But once that was over, it was over. CL admitted that he initially had trouble moving on. Pete Rock and CL would occasionally reunite in the 2000s, much to the delight of fans who loved what they’d done together in their heyday. Rock’s lengthy resume now includes work with Nas, the LOX and a host of others, but it’s the legacy of Mecca and the Soul Brother that still kick-started and still defines so much of who he is. And for CL Smooth, he can now look back with fondness at what he and his old friend were able to create.